Well here I am in Kona. My first day here, but rather than writing about how great it’s been swimming in the ocean or riding the Queen K I’m saving that to start talking about the taper. I have already deviated from the plan with Steven inviting me on his ride. What was to be one hour of easy riding became 4 hours 30 minutes of moderately paced stuff (actually the Powertap says it was easier than I thought, I was just knackered). Harder than I wanted and my legs were sore thanks to hours of flying and little sleep. The plus side is all the swelling seems to have gone down! Eating paleo is proving pretty easy here too which is a big bonus! Plenty of options as long as you’re selective. All been low on carbs so far with lots of proteins and fats. Hopefully that’ll see me lean through to race day. You want to be lean here believe me. When all the athletes are out on parade there’s no room for body fat! I’m told I look like I fit in so that’s good. Enough of that though – the taper plan. As mentioned recently I’m breaking this down into the bike and run separately. Today’s post is about the evidence from my previous races which is guiding my plan for Kona. Not a chart, but a table pulled from WKO+ then with a bit of work in Excel assembled here (also with some callings on my old web developer skills!) What we’re looking at here is the four weeks leading up to each of my Ironman races this year. I’ve arbitrarily chosen to look at the ATL/CTL/TSB values on one day each of those weeks. The idea being to see how they changed over that time. Then knowing how the race went and how I felt during it I can assess the value of the figures. As a reminder Acute Training Load (ATL) is sometimes known as fatigue I want this to be fairly low for a race. Chronic Training Load (CTL) is fitness, a high value should mean better performance really. Also the advice out there suggests not dropping it more than 10% during your taper. Finally Training Stress Balance (TSB) is the difference between the two and called form. Positive TSB is good, but too much is bad! The guidelines I’ve seen talk of values in the 10 to 20 range prior to a race. That out the way from my four races I would say Ironman Australia was a poor day for me and I never felt good at any stage. Ironman Lanzarote is discounted unfortunately as my injury at the time ruined the race. Roth was a good race though I felt a little tired on the bike, but went well on the run. Ironman UK was also good the bike picked up towards the end and the run was solid. If I’m going to learn anything from these numbers it seems Roth and UK are my guides and Oz is what to avoid. I’m a little wary with Ironman UK given that it was unusual circumstances leading up to that. From the data though my suspicion is that a TSB of 20ish will be good for the bike here. I may try and get it as high as 25 given I felt tired in Roth. The massively high TSB in Oz helps explain why I felt so flat on the bike out there! Feeling tired in Roth might have something to do with the relatively small change in CTL. In fact an increase over the 4 weeks leading into the race. Even considering the shorter taper I opted for as the UK was my main race it was a small decline in the final week. I think I need to be much closer to the 10% drop off figure for the duration of the taper here. The UK was an exceptionally heavy drop off due to the struggle to train between the two. Not strictly relevant to Kona, but with ITU Long Course Worlds two weeks after Hawaii getting myself moving again will be essential this time. Lanza might have had potential too! Well I can skip the explanation of terms this time! Look at the figures and 10 to 15 stands out for TSB. Lanza might have been a little low, not that I’ll know for sure. Oz may have been a little too high. More significantly in Oz I think the drop off in CTL was once again way too high. Clearly no where near as high as for the UK, but again I cite special circumstances. I suspect that the very regular nature of my run training now lends itself to a smaller more controlled lowering of CTL as general daily stress isn’t too bad even if CTL can end up quite high. My focus on consistency lets my body tolerate a very steady level of CTL. The biggest thing is dropping the ATL enough to get the positive TSB and a bit less fatigue overall. Simply shortening my longer runs and cutting a couple of regular runs is nearly enough for that. Just for completeness this is the overall performance table. It combines the values from bike and run. Previously I had been using this as a very rough guide during my tapers. To be honest in the past my tapers were far closer to art than science! Really digging into the numbers like this is all new to me! The problem with viewing the combined table is overly tapering for the run or bike can hide under tapering for the other. Whilst there are interactions between the two, they both use the same limbs after all, in terms of tapering I now feel that viewing them separately is important. A TSB of 30 to 35 may be great for racing, but probably not is it’s made up of a TSB of 50 on the bike and -15 on the run for example. I’d expect to be running very poorly in that extreme instance. The factor that is a little more surprising here though is how high the combined TSB seems to end up being. Again the UK is exceptionally high, but Roth is also 35. Guidelines talk of 10 to 20, but I’m now considering that in individual sports. The resulting total TSB is much higher as a consequence, but seems to work well. Whilst CTL is high, the percent change doesn’t vary much from 10% still. That remains fairly true. As before you’ll note how small it was for Roth and how large for the UK. 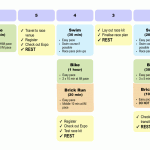 In planning Kona I should be hitting much closer to 10% over the taper period. A final limitation of the combined chart, in fact of all of this tapering system. The lack of swim training stress. I can’t taper swimming individually at the moment and it obviously doesn’t factor into the combined table one bit. I aim to work on this in the build for Western Australia and hopefully have something in place so I can work with data in the coming year. In the end there is an element of art to tapering and however much I try to bring maths and science into it I’ll be going on feel a good amount of the time. I was surprised when I came to draw up the final taper plan for Kona that I had so much training to do in the time. It wasn’t anywhere near as restful as I usually do. It eases off as the race gets closer, but still has a solid amount of work in week one. A taper week over 20 hours? I’m not 100% sure of that one! Of course here I am on day two of the taper and I’ve done far more than intended. The ride today was much bigger than expected! Still it seems to have helped clear some of the travel out of the legs and hopefully tomorrow’s bigger ride will feel much nicer. What it does mean is I can reduce some of the training later in the weak to balance things out. And that means more time in coffee shops. Perfect! 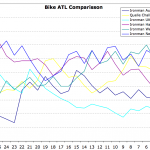 Part two will look at projecting the numbers for Kona and possibly that ITU World Champs too. I’ll also put out the taper plan and notes on how it’s going. Before I post that I’ll try and get a more colourful Kona experience blog up. I’ve had a great first day and am really looking forward to the week ahead.